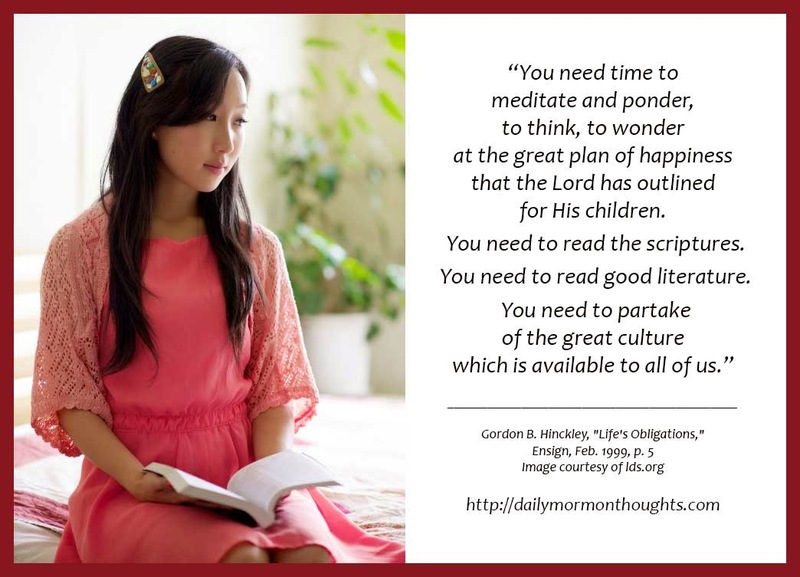 "You need time to meditate and ponder, to think, to wonder at the great plan of happiness that the Lord has outlined for His children. 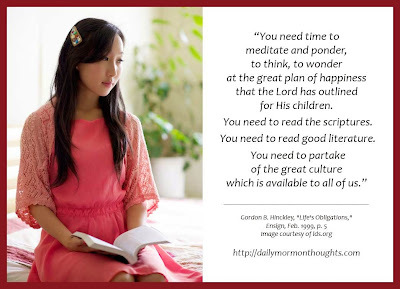 You need to read the scriptures. You need to read good literature. You need to partake of the great culture which is available to all of us. "I believe that with all my heart. Our lives become extremely busy. We run from one thing to another. We wear ourselves out in thoughtless pursuit of goals which are highly ephemeral. We are entitled to spend some time with ourselves in introspection, in development. I remember my dear father when he was about the age that I am now. He lived in a home where there was a rock wall on the grounds. It was a low wall, and when the weather was warm, he would go and sit on his wall. It seemed to me he sat there for hours, thinking, meditating, pondering things that he would say and write, for he was a very gifted speaker and writer. He read much, even into his very old age. He never ceased growing. Life was for him a great adventure in thinking. "Your needs and your tastes along these lines will vary with your age. But all of us need some of it. I decry the great waste of time that people put into watching inane television. I am not antisports. I enjoy watching a good football game or a good basketball game. But I see so many men who become absolutely obsessed with sports. I believe their lives would be enriched if, instead of sitting on the sofa and watching a game that will be forgotten tomorrow, they would read and think and ponder." 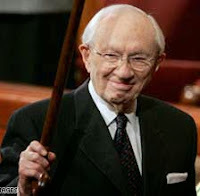 We live in a busy, noisy time; President Hinckley is wise to warn us about "run[ning] from one thing to another" and "wear[ing] ourselves out" as we pursue the wrong kinds of goals. He reminds us to slow down, to take time for learning and pondering about the things that matter most. I love how Pres. Hinckley reminisces about his own father's example of reading and learning, well into his later years. Each of us should know how much our example matters, whether we realize it or not! Especially worth considering is the caution about how we spend leisure time, including watching "inane television," and his perspective on sports. He admits to enjoying occasional football or basketball games himself, but cautions about excessive focus on fleeting activities when we could "read and think and ponder."